Home » Food » Best Cold-Weather Comfort Food: Cassoulet! Best Cold-Weather Comfort Food: Cassoulet! While the U.S. is stuck in the deep freeze (we’re even cold here in California; which for us means high 50s), I’m thinking about some of my favorite cold-weather comfort foods: mac and cheese, hot chocolate and cinnamon toast, tater tot casserole (you can take the boy out of the Midwest …) homemade chicken pot pie, and potato-cheddar soup, to name a few. 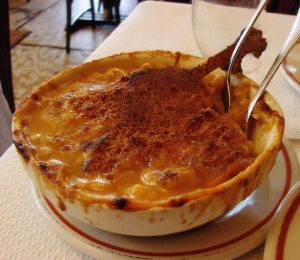 But by far the tastiest and most comforting winter comfort food I’ve ever eaten is French cassoulet, essentially a white-bean stew with duck confit, sausage and thick pieces of bacon baked in a thick sauce, and then topped with bread crumbs and browned under the broiler. Every time I’ve visited Paris I’ve sought out the best cassoulet in the city. And a few years ago I discovered that it’s served at Au Bon Saint Pourcain — a tiny restaurant in the shadow of Saint Sulpice church in the Left Banks 6th Arrondissement. With seating for maybe 20 people and an ever-changing daily menu with roughly the same number of options (typically 10 starters and 10 main dishes), the restaurant is so wonderfully Parisian that it’s almost a cliche. And its cassoulet is out of this world! I’ve yet to try my hand at Julia Child’s cassoulet recipe (it’s included in her seminal cookbook Mastering the Art of French Cooking), but I plan to one of these days. Until then, I’ll just savor the memories of this fantastic delicacy that I’ve enjoyed time and again in the City of Light. 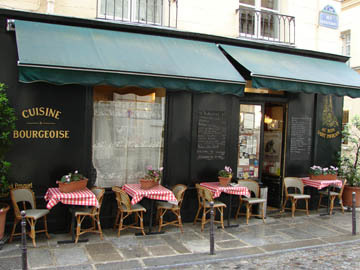 This entry was posted in Food, French cuisine, Restaurants and tagged 6th Arrondissement, Au Bon Saint Pourcain, cassoulet, food, Left Bank, restaurants, Saint Sulpice by Bob Adams. Bookmark the permalink.